Asbestos still kills around 5000 workers each year. Somewhat remarkably, this is more than the number of people killed on the road. Around 20 tradesmen die each week as a result of past exposure. It can take anywhere between 15-60 years for symptoms to develop after exposure, so illness or disease will not affect you immediately, but may do in later life. Even though asbestos was banned in 1999, when it was a widely used material for commercial buildings, homes and machinery, a significant risk still remains. Its dangerous because when materials containing asbestos are moved, modified, disturbed or damaged, deadly fibres are released into the air. When inhaled or ingested, these fibres become trapped in the mucous membranes of the nose and throat, where they can sometimes be removed. However, if they pass deep into the lungs or are swallowed into the digestive tract, they become trapped in the body and can cause serious health problems. Asbestos-containing material isn’t considered to be harmful, but rather the dust and fibres that are released when disturbed. Therefore, it becomes an ever-present problem for tradesmen, labourers and the construction industry. If you’re worried that your home or place of work contains harmful materials, Sperion can conduct asbestos surveys to locate any problems. But remember, things like ceiling and floor tiles, shingles, fire doors and cabinet tops will not release dangerous asbestos fibres unless they are damaged in some way. Deterioration from continual vibration, aging, water and physical impact from drilling and grinding can break down materials though. Symptoms of this non-cancerous respiratory disease include shortness of breath and a cracking sound in the lungs while inhaling. Asbestos fibres aggravate tissue in the lungs and cause them to scar. There is no effective treatment for asbestosis, which means it is usually disabling or fatal. This causes the largest number of deaths among people exposed to asbestos exposure. However, the incidence of lung cancer in people working closely with asbestos is higher than the general population. A lot of the time, victims will be exposed to some other sort of carcinogen, such as cigarette smoke. Symptoms include shortness of breath, chest pains, hoarseness and anaemia. Nearly all cases of mesothelioma are linked to asbestos exposure, however it is still quite a rare form of cancer. Mesothelioma occurs in the thin membrane lining the lungs, chest and abdomen. It is almost always fatal. For more information or guidance about asbestos, be sure to contact Sperion today. We can conduct asbestos surveys in your home or place of work and remove harmful materials to keep occupants and workers free from danger. Don’t risk anyone’s health, the solution is simple for all to see, call in the experts to get your survey performed prior to deciding what the best course of action to take is. In order to deal with any problem with such materials that are identified during a survey you need to be fully informed of all of the pertinent facts first! Rochdale Electric Welding Company (REWCO) has been ordered to pay more than £20,000 after exposing employees to potentially fatal asbestos fibres at an industrial site in Devon. Asbestos dust and fibres were released on 25 May 2010 during work to remove industrial boilers, associated fixed pipework and a boiler house at a redundant Dairy Crest site near Totnes railway station. The dangerous material remained exposed until a clean-up operation belatedly commenced two days later. The national dairy company was prosecuted on Friday 13 September alongside REWCO, of Middleton, after the Health and Safety Executive (HSE) identified failings with the planning of the job and a lack of training for workers involved. Plymouth Crown Court heard that Dairy Crest had agreed to sell boilers from the redundant plant at Totnes, plus another site in Somerset, to REWCO, with the welding firm also dismantling all associated fixed plant pipework at both sites and demolishing the boiler house at Totnes as part of the purchase. HSE established that on 24 May 2010 REWCO began removing the boilers at the Totnes site without carrying out sufficient enquiries in advance to determine whether asbestos was present. Dairy Crest had carried out a suitable survey for asbestos material some years previously, but they failed to pass on this report. Three REWCO workers carried out the removal of the boilers and pipework while wearing normal work clothes that became contaminated with asbestos dust and fibres. As a result all three were exposed, and could potentially face long-term respiratory problems and even incurable lung diseases. HSE inspectors visited the site on 27 May 2010 and found widespread contamination. Steps were immediately taken to prevent any further risk to anybody on the site or nearby. Dairy Crest Limited, of Claygate House, Littleworth Road, Esher, Surrey, was fined £12,000 and ordered to pay a further £22,214 in costs after pleading guilty to a single breach of the Control of Asbestos Regulations 2006 in its capacity as the main duty holder for the site. Rochdale Electric Welding Company Limited, of Dingle Farm, Hollin Lane, Middleton, pleaded guilty to two breaches of the same legislation for its role in undertaking the work. The company was fined a total of £8,000 with £13,786 in costs. Speaking after the hearing, HSE Inspector, Martin Lee said: “This was a very serious incident that could severely impact on the future health of the employees who worked with and near the asbestos. Both Dairy Crest Ltd and Rochdale Electric Welding Company Ltd committed safety failings that led to them being needlessly exposed to dangerous dust and fibres. “There were clear failings by both companies to identify and properly manage and control the asbestos containing material before work started, and to provide appropriate protection for workers when it did. “Regulations on dealing safely with asbestos have been in place for many years and are widely known in the industry. “This totally needless incident would not have happened if Dairy Crest Ltd had provided Rochdale Electric Welding Company with the results of its asbestos survey and if Rochdale Electric Welding Company had carried out proper enquiries before commencing work at the site.” For further information on how to reduce the risk of asbestos calling one of the sperion asbestos team for advice. Some £150m in compensation is expected to be paid to former Harland and Wolff workers who contracted asbestos-related diseases while working at the shipyard. More than 2,000 people have been already been paid compensation. Asbestos was a widely-used insulation material in shipbuilding until the 1970s. Many workers contracted asbestos-related diseases after they were exposed to its fibres. The legacy of the once government-owned Belfast shipyard is still causing misery for thousands of former workers. To date more than 2,000 former workers, relatives and contractors who worked in the yard before it was privatised in 1989 have successfully claimed for compensation at a cost of £60m. That is an average of £30,000 each. 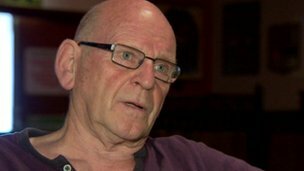 Billy Graham from east Belfast, who worked in ship repair in the yard for 20 years, is one of the former workers who was awarded compensation. Range of diseases He said: “We were told nothing about asbestosis. When you were working with old boilers, there was an asbestos ring around them, and we just pulled them off and the dust was flying everywhere. “It’s a big shock when you are told you have a mild form of asbestosis. It does not get any better. It affects you that you can’t walk. You can’t do certain things. You can’t play with the grandkids the way you used to. You are just beat.” The former employees are suffering from a range of diseases including asbestosis, mesothelioma, pleural plaques and lung cancer. It is not just shipyard workers who were affected. In some cases there was “secondary contamination” – where people close to the those working in the yard contracted an asbestos-related disease. East Belfast man Eddie Harvey worked in the yard for 20 years. His wife Margaret died in December 2008, aged 65, from fibres she breathed in while washing his work clothes. The director of a Bromley firm has given a suspended jail sentence after removing asbestos without a licence and deceiving the householders by providing a doctored air test saying the room was safe to re-enter. Southwark Crown Court was told today (13 Sept 12) that Absolute Asbestos Ltd was hired to take out all the asbestos insulation from the boiler room of a home in Camden. Mr Horrey, the sole director of the firm, did the work over eleven days in July last year. As well as being unlicensed to remove asbestos, Mr Horrey failed to effectively clean and decontaminate the area. He left visible fibres that were a danger to the householders and to the plumbers, who were due to start work in the boiler room. After he was finished, an analyst who went to take an air test provided him with a certificate clearly showing the site had failed. However, Mr Horrey provided a doctored report to the owners indicating it had passed the test and was safe for them to re-enter, which they did. Mr Horrey, of Jackson Road, Bromley, Kent, had pleaded guilty at an earlier hearing to three breaches of the asbestos regulations between 18 and 29 July 2011 at Greencroft Gardens, NW6. He was given six months’ prison sentence on each charge, to run concurrently and suspended for two years; 300 hours’ unpaid community service; given an electronic curfew between 9pm and 6am for three months; ordered to pay £11,340 to the affected Residents’ Association in Camden and ordered to pay £10,160 costs. A leading hotel chain has been ordered to pay more than £200,000 in fines and costs after construction workers and guests were put at risk of asbestos exposure at a Kent hotel. Cheshire-based Britannia Hotels Ltd failed to ensure a full asbestos assessment was undertaken before construction workers refurbished a wing of The Grand Burstin Hotel in Harbour Way, Folkestone, between February and July 2010.